The present invention is a method for efficiently incorporating a UV absorber into a polyester resin. The method includes forming a reaction mixture comprising a diol component, a diacid component selected from the group consisting of dicarboxylic acids, dicarboxylic acid derivatives, and mixtures thereof, an antimony containing compound, a phosphorus containing compound, a metal containing compound, and a UV absorber. The reaction mixture is polymerized in a polycondensation reaction system. In another embodiment of the present invention, the UV absorber is added while the reaction products from one reactor are transferred to the next reactor in the polycondensation reaction system. A polyester composition having the UV absorber incorporated therein is also disclosed. This application is a continuation-in-part of and claims benefit to the earlier filed application having U.S. Ser. No. 10/618,274 filed Jul. 11, 2003 the entire disclosure of which is incorporated herein by reference. In at least one aspect, the present invention relates to methods of efficiently incorporating UV absorbers into polyester composition and to polyester compositions made by said methods. Polyester is a polymeric resin widely used in a number of packaging and fiber based applications. Poly(ethylene terephthalate) (“PET”) or a modified PET is the polymer of choice for making beverage and food containers such as plastic bottles and jars used for carbonated beverages, water, juices, foods, detergents, cosmetics, and other products. In the typical polyester forming polycondensation reaction, a diol such as ethylene glycol is reacted with a dicarboxylic acid or a dicarboxylic acid ester. The reaction is accelerated by the addition of a suitable reaction catalyst. Since the product of the polyester condensation reaction tends to be reversible and in order to increase the molecular weight of the polyesters, this reaction is often carried out in a multi-chamber polycondensation reaction system having several reaction chambers operating in series. Typically, the diol and the dicarboxylic acid component are introduced in the first reactor at a relatively high pressure. After polymerizing at an elevated temperature the resulting polymer is then transferred to the second reaction chamber which is operated at a lower pressure than the first chamber. The polymer continues to grow in this second chamber with volatile compounds being removed. This process is repeated successively for each reactor, each of which are operated at lower and lower pressures. The result of this step wise condensation is the formation of polyester with higher molecular weight and higher inherent viscosity. During the polycondensation process, various additives such as colorants and ultraviolet light (UV) absorbers may be added. UV absorbers are a particularly important additive, both for imparting stability to the polyesters and to protect those products packaged in PET containers from degradation induced by exposure to UV light. U.S. Pat. No. 4,617,374 (hereinafter '374 patent) discloses the use of certain UV absorbing methine compounds that may be incorporated in a polyester or a polycarbonate during polycondensation. These compounds enhance ultraviolet or visible light absorption with a maximum absorbance within the range of from about 320 nm to about 380 nm. Functionally, these compounds contain an acid or ester group which condenses onto the polymer chain as a terminator. Moreover, the UV absorbers of the '374 patent have been found to be useful in the preparation of polyesters such as poly(ethylene terephthalate) and copolymers of poly(ethylene terephthalate) and poly(1,4-cyclohexylenedimethylene terephthalate). It has been observed, however, that some UV absorbers are somewhat volatile causing the yield of these UV absorbers in the formed polyester to be somewhat less than 100% (values of 80% to 85% are typical). Moreover, these compounds may plug the equipment by condensing in the process lines. The loss of UV absorber results in added costs for the polyester formation because of the down time needed to clean process lines and because of the relatively high cost of these compounds. Accordingly, there is a need for improved methods of incorporating UV absorbers into polyester compositions made by the melt phase polycondensation method, and/or improved polyester compositions containing UV absorbers. The present invention overcomes the problems of the prior art by providing a method of incorporating a UV absorber into a polyester resin. In one embodiment, a method comprises forming a reaction mixture substantially free of a titanium containing ester exchange catalyst compound and comprising combining a diol, a diacid component selected from the group consisting of dicarboxylic acids, dicarboxylic acid derivatives, and mixtures thereof, an antimony containing compound in an amount of less than 0.1% of the total weight of the reaction mixture, a phosphorus containing compound present in an amount of less than about 0.1% of the total weight of the reaction mixture, a metal containing compound selected from the group consisting of zinc containing compounds, manganese containing compounds, present in an amount from about 10 ppm to about 300 ppm, and a UV absorber with polyester reactive moieties. The antimony containing compound, the phosphorus containing compound, and the metal-containing compound comprise the catalyst system used to promote the condensation polymerization that occurs in the method of the invention. The reaction mixture is then polymerized in a polycondensation reaction system in the absence of the titanium ester exchange catalyst compound. The polycondensation reaction system is characterized by having a first reaction chamber, a last reaction chamber, and optionally one or more intermediate reaction chambers between the first reaction chamber and the last reaction chamber. The reaction system is operated in series such that the reaction mixture is progressively polymerized in the first reaction chamber, the one or more intermediate reactions, and the last reaction chamber. Accordingly, as the reaction mixture proceeds through the series of reaction chambers, polymerization occurs and a polyester is formed by the condensation reaction of the diol and the diacid component. Moreover, volatile compounds are removed in each reaction chamber and the average molecular weight of the polyester increases from reactor to reactor by the decreasing reaction pressures of the successive reaction chambers. In another embodiment of the present invention, a method of incorporating a UV absorber in a polyester composition is provided. The method of this embodiment comprises. wherein i and k are integers and k is the total number of reaction chambers. In another embodiment of the present invention, a titanium metal free polyester composition is provided. The titanium free polyester composition of this embodiment comprises a diol residue, as diacid residue, a UV absorber residue, antimony atoms, phosphorus atoms, and metal atoms selected from the group consisting of zinc, manganese, and mixtures thereof. The antimony, phosphorus, and metal atoms represent the residue of the catalyst system used to promote the condensation polymerization that forms the polyester composition. In yet another embodiment of the present invention, an article made from the polyester is provided. Reference will now be made in detail to presently preferred compositions or embodiments and methods of the invention, which constitute the best modes of practicing the invention presently known to the inventors. The term “residue” as used herein, refers to the portion of a compound that is incorporated into a polyester composition. In an embodiment of the present invention, a method of incorporating a UV absorber into a polyester resin is provided. The method of this embodiment comprises forming a reaction mixture substantially free of a titanium containing ester exchange catalyst compound and comprising a diol, a diacid component selected from the group consisting of dicarboxylic acids, dicarboxylic acid derivatives, and mixtures thereof, an antimony containing compound in an amount of less than 0.1% of the total weight of the reaction mixture, a phosphorus containing compound present in an amount of less than about 0.1% of the total weight of the reaction mixture, a metal containing compound selected from the group consisting of zinc containing compounds, manganese containing compounds, present in an amount from about 10 ppm to about 300 ppm, and a UV absorber. We have found that polyester compositions, can be made from reaction mixtures substantially free of titanium containing ester exchange catalysts with high yields of UV absorbers. While the mechanism to explain this phenomena is not fully understood, it is believed that the presence of titanium containing ester exchange compounds have such high conversion activity that the catalyst may also contribute to reactions which degrade some UV absorbers, preventing the UV absorbers from absorbing, dissolving, or otherwise tying into the polyester polymer, or both. As used herein, the phrase “substantially free” or “in the absence of” does not preclude the presence of trace amounts of titanium containing compounds, and in this regard, the presence of 0 to about 5 ppm of titanium metal is considered a trace amount which can be found in the polyester composition made by what is considered to be a process conducted in the absence of a titanium containing ester exchange catalyst. Preferably, the process is conducted using compounds containing 2 ppm or less of titanium metal, and more preferably 0.0 ppm of titanium metal containing compounds are used in the process of the invention. Although it is desired to keep titanium metal to a minimum, of from 0 to about 5 ppm of titanium metal, desirably, less than 2 ppm can be added to the polyester composition and still be in accordance with the present invention. More desirably, 0.0 ppm of titanium metal is added to the polyester composition. In this embodiment, the reaction mixture is then polymerized in a multi-chamber polymerization system. The polycondensation reaction system is characterized by having a first reaction chamber, a last reaction chamber, and one or more intermediate reaction chambers between the first reaction chamber and the last reaction chambers. The reaction system is operated in series such that the reaction mixture is progressively polymerized in the first reaction chamber, the one or more intermediate reactions, and the last reaction chamber. The UV absorber may be added at any point in the melt phase. The polyester removed from the last reaction chamber has an inherent viscosity from about 0.2 to about 0.75 dL/g. Finally, the reaction mixture is further characterized by having from 0.0 to about 5 ppm titanium containing atoms. wherein X is hydrogen or up to two moieties selected from the group consisting of hydroxy, C1-C6 alkyl, C1-C6alkoxy and halogen, and wherein the UV absorbing compound includes a polyester reactive group. L1 is a di, tri, or tetravalent linking group, where the divalent radical is selected from the group consisting of C2-C12-alkylene, —(CHR′CHR″O—)pCHR′CHR″—, C1-C2-alkylene-arylene-C1-C2-alkylene, —CH2CH2O-arylene-OCH2CH2, and —CH2-1,4-cyclohexylene-CH2—; where the trivalent and tetravalent radicals are selected from the group consisting of C3-C8 aliphatic: hydrocarbon having three or four covalent bonds. Examples of trivalent and tetravalent radicals include —CH(—CH2—)2 and C(CH2—)4. 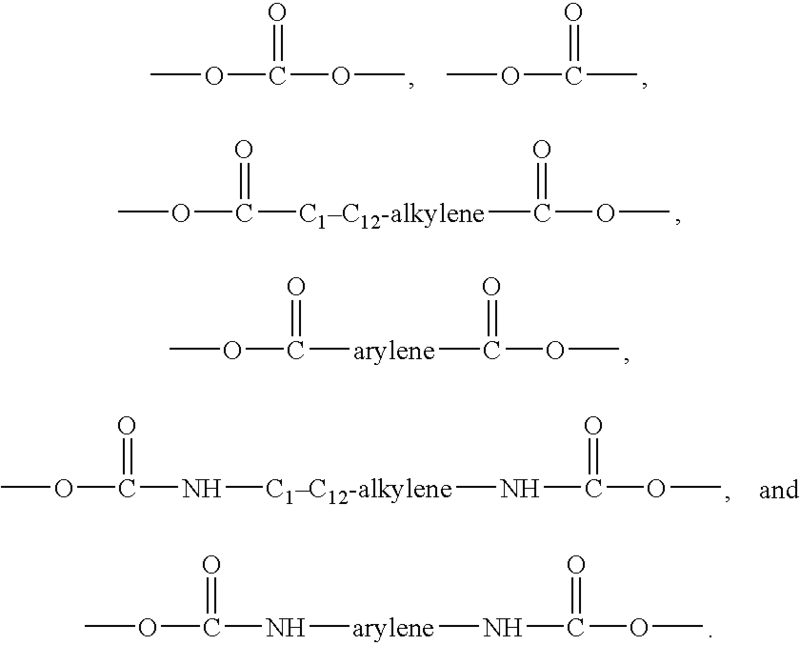 A and A1 are independently selected from the group consisting 1,4-phenylene and 1,4-phenylene substituted with one or two groups selected from the group consisting of hydroxy, halogen, C1-C6-alkyl and C1-C6-alkoxy, wherein at least one polyester reactive group is present on each of the UV absorbers of Formulae II-VII above. L3 is selected from the group consisting of C2-C6-alkylene, —(CHR′CHR″O—)pCH2CH2—, and C3-C8-alkenylene. The alkoxylated moiety denoted by the formula —(CHR′CHR″O—)p herein has a chain length wherein p is from 1 to 100; preferably p is less than about 50; more preferably p is less than 8, and most preferably p is from 1-3. In a preferred embodiment the alkoxylated moiety comprises ethylene oxide residues, propylene oxide residues, or residues of both. The term “C1-C12-alkyl” is used to denote an aliphatic hydrocarbon radical that contains one to twelve carbon atoms and is either a straight or a branched chain. R15 is selected from the group consisting of C1-C6-alkyl, C3-C8-cycloalkyl, C3-C8-alkenyl and aryl. The term “C1-C6-alkyl” is used to denote straight or branched chain hydrocarbon radicals and these optionally substituted, unless otherwise specified, with 1-2 groups selected from hydroxy, halogen, carboxy, cyano, aryl, aryloxy, arylthio, C3-C8-cycloalkyl, C1-C6-alkoxy, C1-C6-alkylthio; C1-C6-alkylsulfonyl; arylsulfonyl; C1-C6-alkoxycarbonyl, and C1-C6-alkanoyloxy. The terms “C1-C6-alkoxy”, “C1-C6-alklythio”, “C1-C6-alkylsulfonyl”, “C1-C6-alkoxycarbonyl”, “C1-C6-alkoxycarbonyloxy”, “C1-C6-alkanoyl”, and “C1-C6-alkanoyloxy” denote the following structures, respectively: —OC1-C6-alkyl, —S—C1-C6-alkyl, —O2S—C1-C6-alkyl, —CO2—C1-C6-alkyl, —OCO2C1-C6-alkyl, —OC—C1-C6-alkyl, and —OCO—C1-C66-alkyl wherein the C1-C6-alkyl groups may optionally be substituted with up to two groups selected from hydroxy, halogen, cyano, aryl, —OC1-C4-alkyl, —OCOC1-C4-alkyl and —CO2C1-C4-alkyl, wherein the C1-C4-alkyl portion of the groups represents a saturated straight or branched chain hydrocarbon radical that contains one to four carbon atoms. The terms “C3-C8-cycloalkyl” and “C3-C8-alkenyl” are used to denote saturated cycloaliphatic radicals and straight or branched chain hydrocarbon radicals containing at least one carbon-carbon double bond, respectively, with each radical containing three to eight carbon atoms. The terms “C1-C12-alkylene”, “C2-C6-alkylene” and “C1-C2-alkylene” denote straight or branched chain divalent hydrocarbon radicals containing one to twelve, two to six, and one to two carbon atoms, respectively, and these optionally substituted with one or two groups selected from hydroxy, halogen, aryl and C1-C6-alkanoyloxy. The term “C3-C8-alkenylene” is used to denote a divalent straight or branched chain hydrocarbon radical that contains at least one carbon-carbon double bond and with each radical containing three to eight carbon atoms. The term “C3-C8-cycloalkylene” denotes a C3 to C8 divalent hydrocarbon radical having from three to eight carbon atoms, optionally substituted with one or two groups selected from hydroxy, halogen, aryl and C1-C6-alkanoyloxy. In the terms “aryl”, “aryloxy”, “arylthio”, arylsulfonyl” and “aroyl” the aryl goups or aryl portions of the groups are selected from phenyl and naphthyl and these optionally substituted with hydroxy, halogen, carboxy, C1-C6-alkyl, C1-C6-akoxy and C1-C6-alkoxycarbonyl. In the terms “heteroaryl” and “heteroarylthio” the heteroaryl groups or heteroaryl portions of the groups are mono or bicylic heteroaromatic radicals containing at least one heteroatom selected from oxygen, sulfur and nitrogen or a combination of these atoms, in combination with carbon to complete the aromatic ring. 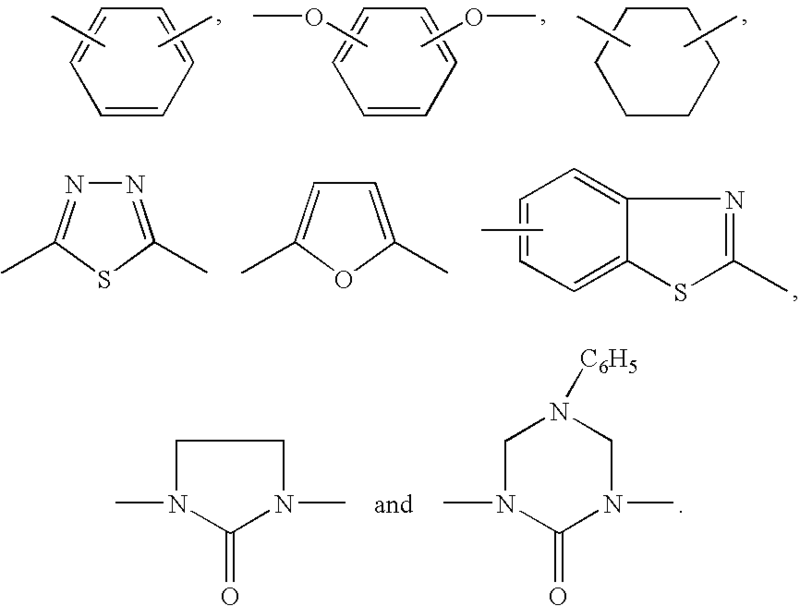 Examples of suitable heteroaryl groups include: furyl, thienyl, benzothiazoyl, thiazolyl, isothiazolyl, pyrazolyl, pyrrolyl, thiadiazolyl, oxadiazolyl, benzoxazolyl, benzimidazolyl, pyridyl, pyrimidinyl and triazolyl and such groups substituted with 1-2 groups selected from C1-C6-alkyl, C1-C6-alkoxy, C3-C8-cycloalkyl, cyano, halogen, carboxy, C1-C6-alkoxycarbonyl, aryl, arylthio, aryloxy and C1-C6-alkylthio. The term “halogen” is used to include fluorine, chlorine, bromine and iodine. The term “carbamoyl” is used to represent the group having the formula: —CON(R13)R14, wherein R13 and R14 are as previously defined. wherein X, R1 and R2 are as defined previously. The skilled artisan will understand that each of the references herein to groups or moieties having a stated range of carbon atoms such as C1-C4-alkyl, C1-C6-alkyl, C1-C12-alkyl, C3-C8-cycloalkyl, C3-C8-alkenyl, C1-C12-alkylene, C2-C6-alkylene, etc. includes moieties of all of the number of carbon atoms mentioned within the ranges. For example, the term “C1-C6-alkyl” includes not only the C, group (methyl) and C6 group (hexyl) end points, but also each of the corresponding C2, C3, C4, and C5 groups including all isomers. In addition, it will be understood that each of the individual points within a stated range of carbon atoms may be further combined to describe subranges that are inherently within the stated overall range. For example, the term “C3-C8-cycloalkyl” includes not only the individual cyclic moieties C3 through C8, but also contemplates subranges such as C4-C6-cycloalkyl. The term “polyester reactive group” is used herein to describe a group which is reactive with at least one of the functional groups from which the polyester is prepared under polyester forming conditions. Example of such groups are hydroxy, carboxy, C1-C6-alkoxycarbonyl, C1-C6-alkoxycarbonyloxy and C1-C6-alkanoyloxy and the like. The level of UV absorber added as a component of any of these embodiments is dependent on the application for which the polyester product is intended, the level of UV exposure expected, the sensitivity of any article enclosed by the polyester to UV light, the molar extinction coefficient of the specific UV absorber chosen, the thickness of the article to be prepared from the polyester, the nature of the other additives present in the polyester; including any colorants, opacifiers, catalyst residues, reheat agents, nucleators, de-nesting agents, slip agents etc. whether added prior to the polymerization, during the polymerization or post-polymerization, and the composition of the polyester repeat unit among other factors. Generally, for most packaging applications, the expected level of UV absorber required would be between 0 and 5 wt. % based on the weight of polymer; more preferably between 0.001 and 2 wt. % based on the weight of polymer. These ranges stated are given for illustrative purposes only and are not intended to limit the scope of the present invention. The polymerization is carried out such that the reaction pressure in the first chamber is from about 20 to 50 psi and the reaction pressure in the last reaction chamber is from about 0.1 mm Hg to about 2 mm Hg. The pressure in the intermediate reactor is successively dropped with the reaction pressure in each of the one or more intermediate reactor being between 50 psi and 0.1 mm Hg. The reaction temperature in each reaction chamber is from about 200° C. to about 300° C.
The reaction mixture used in the method of the invention includes a diol component. Preferably, the diol component is a glycol. Suitable diols include, for example, diols selected from the group consisting of ethylene glycol, 1,4-cyclohexanedimethanol, 1,2-propanediol, 1,3-propanediol, 1,4-butanediol, 2,2-dimethyl-1,3-propanediol, 1,6-hexanediol, 1,2-cyclohexanediol, 1,4-cyclohexanediol, 1,2-cyclohexanedimethanol, 1,3-cyclohexanedimethanol, 2,2,4,4-tetramethyl-1,3-cyclobutane diol; X,8-bis(hydroxymethyl)tricyclo-[5.2.1.0]-decane wherein X represents 3, 4, or 5, and diols containing one or more oxygen atoms in the chain, e.g., diethylene glycol, triethylene glycol, dipropylene glycol, tripropylene glycol and the like containing from about 2 to about 18, preferably 2 to 12 carbon atoms in each aliphatic moiety. Cycloaliphatic diols can be employed in their cis or trans configuration or as mixtures of both forms. More preferably, the diol comprises a component selected from the group consisting of ethylene glycol, diethylene glycol, 1,4-cyclohexanedimethanol, or mixtures thereof. In many cases, the diol may comprise a major amount of ethylene glycol and modifying amounts cyclohexanedimethanol and/or diethylene glycol. The reaction mixture also includes a diacid component selected from the group consisting of aliphatic, alicyclic, or aromatic dicarboxylic acids and esters of such dicarboxylic acids. Suitable diacid components are selected from the group consisting of terephthalic acid, naphthalene dicarboxylic acid, isophthalic acid, 1,4-cyclohexanedicarboxylic acid, 1,3-cyclohexanedicarboxylic acid, succinic acid, glutaric acid, adipic acid, sebacic acid, 1,12-dodecanedioic acid, and the like; and esters of these dicarboxylic acids. In the polymer preparation, it is often preferable to use a functional acid derivative thereof such as the dimethyl, diethyl, or dipropyl ester of the dicarboxylic acid. The anhydrides of these acids also can be employed. Preferably, the diacid component comprises a dicarboxylic acid ester. More preferably, the diacid component is tetephthalic acid or dimethyl terephthalate. Most preferably, the diacid component comprises dimethyl terephthalate. The molar ratio of the diol component to the diacid component is from about 0.5 to about 4. More preferably, the molar ratio of the diol component to the diacid component is from about 1 to about 3. 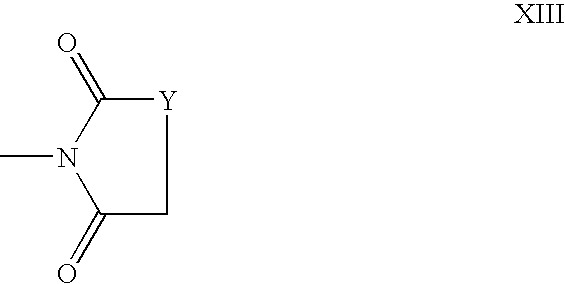 Most preferably, the ratio of the diol to the diacid component is about 2. The reaction mixture further comprises a component containing a metal selected from the group consisting of zinc, manganese, and mixtures thereof, antimony containing component, and a phosphorus containing component. Typically, the metal containing component is zinc acetate or manganese acetate, the antimony containing component is antimony trioxide, and the phosphorus containing component is phosphoric acid or an alkyl ester thereof. Preferably, the metal containing component is zinc acetate and is present in an amount from about 10 to about 200 ppm; the antimony trioxide is present in an amount from about 20 to about 500 ppm, and phosphorous is present in an amount from about 5 to about 200 ppm. The reaction mixture optionally includes one or more components selected from the group consisting of an iron containing compound, a toner, a cobalt containing compound, and mixtures thereof. For example, the reaction mixture and the polyester compositions of the invention may contain black iron oxide in an amount ranging from 1 ppm to 50 ppm, or 1 ppm to 10 ppm. In another embodiment of the present invention, a method of incorporating a UV absorber in a polyester composition with or without a titanium containing ester exchange catalyst is provided. The method of this embodiment comprises forming a reaction mixture comprising a diol, a diacid component selected from the group consisting of dicarboxylic acids, dicarboxylic acid derivatives, and mixtures thereof in a polycondensation reaction system. The polycondensation reaction system comprises a series of reaction chambers. For purposes of differentiating each of the reaction chambers, each chamber may be assigned a label RCi. Accordingly, each chamber is designatable as reaction chamber RCi. The polycondensation system has a first reaction chamber designatable as reaction chamber RCl, a last reaction chamber designatable as reaction chamber RCk, and one or more intermediate reaction chambers. As used herein, i and k are integers, and k is the total number of reaction chambers. The polycondensation system is operated in series such that a reaction product designatable as product Pi from reaction chamber RCi is directly or indirectly transportable to reaction chamber RCi+1 by a conduit designatable as conduit Ci connecting reaction chamber RCi to reaction chamber RCi+1 (i.e., the polymerization product from each reaction chamber is transported to the next reaction chamber in the series). As used herein, “indirectly transportable” recognizes that the product from reaction chamber RCi can be physically disconnected from reaction chamber RCi+1 but still provide feed stock to the reaction chamber, such as via tanker truck or rail car. However, for sake of brevity, it is assumed herein that such reaction chambers and conduits are in fluid communication, but the scope of the invention includes both direct and indirect product transfer. Accordingly, the reaction mixture is successively polymerized as it proceeds through the polycondensation system. Preferably, the UV absorber is added to reaction product Pk−2 while reaction product Pk−2 is transported between reaction chamber RCk−2 and reaction chamber RCk−1 (i.e., the UV absorber is added in the conduit connecting third from the last to the second from the last reaction chamber.) The UV absorbers, the diol, and the diacid component are the same as set forth above with the same amounts as set forth above. The UV absorber may be added neat or in a carrier such as the same or different diol used in RCl. By feeding the UV absorber into the conduit, it is possible to increase the yield of the UV absorber in the polyester composition. Without being bound to a theory, it is believed that by feeding the UV absorber into the conduit, the UV absorber has a sufficient residence time to dissolve into the melt, or be absorbed onto the polymer, or otherwise remain in the melt in contrast with adding the UV absorber to reaction chamber which typically operates under conditions promoting loss of the UV absorber as it is carried off with the flashing of the diol. In this embodiment, the reaction is preferably conducted in the presence of 0.0 to 5 ppm titanium containing ester exchange catalysts, more preferably using 0.0 ppm titanium containing compounds. In yet another embodiment of the present invention, a titanium free polyester composition is provided. Preferably, the polyester composition is made by any one of the methods of the invention. The titanium free polyester composition of this embodiment comprises a diol residue, as diacid residue, a UV absorber residue, antimony atoms present in an amount of less than 0.1%; phosphorus atoms present in an amount of less than about 0.1%; metal atoms selected from the group consisting of zinc, manganese, and mixtures thereof in an amount from about 5 ppm to about 300 ppm; and titanium atoms present in an amount ranging from 0.0 to 5 ppm. By a titanium free polyester composition is meant one which contains from 0.0 to 5 ppm titanium metal. The UV absorber residue is the residue of the UV absorber set forth above. More preferably, the antimony atoms are present in an amount from about 20 to about 500 ppm and the phosphorus atoms are present in an amount from about 10 to about 200 ppm and the composition contains 2 ppm, most preferably 0.0 ppm titanium metal. The diacid residue is preferably selected from the group consisting of dicarboxylic acid residues, dicarboxylic acid derivative residues, and mixtures thereof. More preferably, the diacid residue is a dicarboxylic acid ester residue. Most preferably, the diacid residue is a dimethyl terephthalate residue. The diol residue is preferably a glycol residue. The diol residue is selected from the group consisting of ethylene glycol residue, diethylene glycol residue, 1,4-cyclohexanedimethanol residue, and mixtures thereof. The ratio of the diol residues to the diacid residues is from about 0.5 to about 4. Moreover, the polyester composition of the present invention has less than about 20 meq/g of carboxyl ends. The present invention is illustrated in greater detail by the specific examples presented below. It is to be understood that these examples are illustrative embodiments and are not intended to be limiting of the invention, but rather are to be construed broadly within the scope and content of the appended claims. Dimethyl terephthalate (“DMT”), ethylene glycol (“EG”), 65 ppm zinc acetate, 1,4-cyclohexanedimethanol (“CHDM”), 230 ppm antimony trioxide, and 70 ppm phosphoric acid, are introduced into the first reaction chamber of a multi-chamber polycondensation reactor at a pressure of about 48 psi. The DMT is fed into the first reaction chamber at a rate of 180 lb/min, the EG is fed into the first reaction chamber at a rate of about 130 lb/min EG, and the CHDM is fed into the first reaction chamber at a rate of about 2.2 lb/min. The zinc acetate is present in an amount of about 65 ppm zinc atoms, antimony trioxide is present in an amount of about 230 ppm antimony atoms, and the phosphoric acid is present in an amount of about 70 ppm phosphorus atoms (the amounts of these ingredients are determined by measuring the amount of metal atom present.) The polymerization product is transported from reactor to reactor with the reaction pressure decreasing in each subsequent reactor chamber. The temperature of each reaction chamber was from about 200° C. to about 300° C. About 4 ppm of a blue toner, 2 ppm of a red toner, and 3.5 ppm of Fe2O3 are introduced into one of the intermediate reaction chambers. During transport of the polymerization product from the third to the last reaction chamber to the second to the last reaction chamber, about 475 ppm of the UV absorber with Formula XI is introduced. The final reaction chamber in the multi-chamber polycondensation reactor is about 0.5 mm Hg. The resulting polyester removed from the last reactor is found to have about 95% of the UV absorber present. One skilled in the art will understand that various thermoplastic articles can be made from, the polyester of the present invention where excellent UV protection of the contents would be important. Examples of such articles includes bottles, storage containers, sheets, films, fibers, plaques, hoses, tubes, syringes, and the like. Basically, the possible uses for polyester having a low-color, low-migratory UV absorber is voluminous and cannot easily be enveloped. 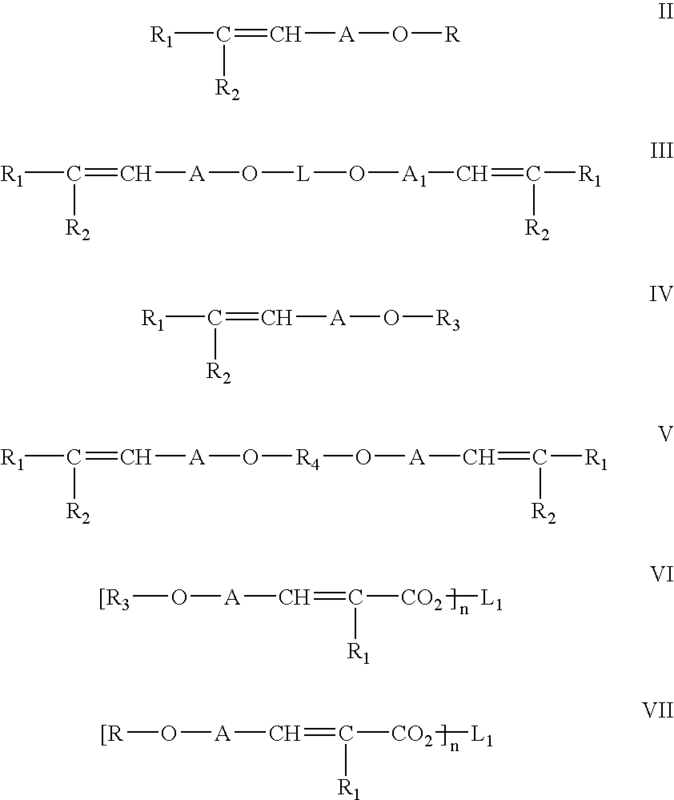 b) polymerizing the reaction mixture in a polycondensation reaction system, the polycondensation reaction system having a first reaction chamber, a last reaction chamber, and one or more intermediate reaction chambers between the first reaction chamber and the last reaction chamber, wherein the reaction system is operated in series such that the reaction mixture is progressively polymerized in the first reaction chamber, the one or more intermediate reactions, and the last reaction chamber. A and A1 are independently selected from the group consisting of 1,4-phenylene and 1,4-phenylene substituted with one or two groups selected from the group consisting of hydroxy, halogen, C1-C6-alkyl and C1-C6-alkoxy. L3 is selected from the group consisting of C2-C6-alkylene, —(CH2CH2O)p—CH2CH2— and C3-C8-alkenylene, wherein p is an integer from 1 to 100. 5. The method of claim 1 wherein from 0.0 to 2 ppm titanium metal is added the reaction mixture. 6. The method of claim 1 wherein the polymerization with each reaction chamber having a reaction pressure such that the reaction pressure in the first chamber is from about 20 to 50 psi and the reaction pressure in the last reaction chamber is from about 0.1 mm Hg to about 2 mm Hg with the reaction pressure in each of the one or more intermediate reactor being between 50 psi and 0.1 mm Hg. 7. The method of claim 1 wherein from 0.0 ppm titanium metal is added to the reaction mixture. 8. The method of claim 1 wherein the diol component is selected from the group consisting of ethylene glycol; 1,4-cyclohexanedimethanol; 1,2-propanediol; 1,3-propanediol; 1,4-butanediol; 2,2-dimethyl-1,3-propanediol; 1,6-hexanediol; 1,2-cyclohexanediol; 1,4-cyclohexanediol; 1,2-cyclohexanedimethanol; 1,3-cyclohexanedimethanol; 2,2,4,4-tetramethyl-1,3-cyclobutane diol; X,8-bis(hydroxymethyl)tricyclo-[5.2.1.0]-decane, wherein X represents 3, 4, or 5; diols containing one or more oxygen atoms in a chain and mixtures thereof. 9. The method of claim 1 wherein the diacid component comprises a component selected from the groups consisting of terephthalic acid, isophthalic acid, naphthalene dicarboxylic acid, 1,4-cyclohexanedicarboxylic acid, 1,3-cyclohexanedicarboxylic acid, succinic acid, glutaric acid, adipic acid, sebacic acid, 1,12-dodecanedioic acid, and esters thereof; and mixtures thereof. 10. The method of claim 9 wherein the diacid component comprises dimethyl terephthalate. 11. The method of claim 1 wherein the molar ratio of the diol component to the diacid component is from about 0.5 to about 4. 12. The method of claim 1 wherein the reaction mixture further comprises a component containing a metal selected from the group consisting of zinc, manganese, and mixtures thereof, an antimony containing component, and a phosphorus containing component. 13. The method of claim 12 wherein the metal containing component is zinc acetate or manganese acetate, the antimony containing component is antimony trioxide, and the phosphorus containing component is phosphoric acid. 14. The method of claim 13 wherein the metal containing component is zinc acetate present in an amount from about 10 to about 200 ppm. 15. The method of claim 13 wherein the antimony trioxide is present in an amount from about 20 to about 500 ppm. 16. The method of claim 13 wherein the phosphoric acid is present in an amount from about 5 to about 200 ppm. 17. The method of claim 1 further comprising one or more components selected from the group consisting of an iron containing compound, a toner, a cobalt containing compound, and mixtures thereof. c) adding the UV absorber to reaction product Pi as it is transported from reaction chamber RCi to reaction chamber RCi+1, wherein i and k are integer and k is the total number of reaction chambers. wherein X is hydrogen or up to two moieties selected from the group consisting of hydroxy, C1-C6 alkyl, C1-C6 alkoxy and halogen, and wherein the UV absorbing compound includes a polyester reactive group. L3 is selected from the group consisting of C2-C6-alkylene, —(CH2CH2O)p—CH2CH2— and C3-C8-alkenylene, wherein p is an integer less than 50. 22. The method of claim 19 wherein the UV absorber is added to reaction product Pk−2 while reaction product Pk−2 is transported between reaction chamber RCk−2 and reaction chamber RCk−1. 23. The method of claim 19 wherein from 0.0 to 2 ppm titanium containing compounds are added to the reaction mixture. 24. The method of claim 19 wherein the diol component is selected from the group consisting of ethylene glycol; 1,4-cyclohexanedimethanol; 1,2-propanediol; 1,3-propanediol; 1,4-butanediol; 2,2-dimethyl-1,3-propanediol; 1,6-hexanediol; 1,2-cyclohexanediol; 1,4-cyclohexanediol; 1,2-cyclohexanedimethanol; 1,3-cyclohexanedimethanol; 2,2,4,4-tetramethyl-1,3-cyclobutane diol; X,8-bis(hydroxymethyl)tricyclo-[5.2.1.0]-decane, wherein X represents 3, 4, or 5; diols containing one or more oxygen atoms in a chain and mixtures thereof. 25. The method of claim 19 wherein the diacid component comprises a component selected from the groups consisting of terephthalic acid, isophthalic acid, naphthalene dicarboxylic acid, 1,4-cyclohexanedicarboxylic acid, 1,3-cyclohexanedicarboxylic acid, succinic acid, glutaric acid, adipic acid, sebacic acid, 1,12-dodecanedioic acid, and esters thereof, and mixtures thereof. 26. The method of claim 25 wherein the diacid component comprises dimethyl terephthalate. 27. The method of claim 25 wherein the molar ratio of the diol component to the diacid component is from about 0.5 to about 4. 28. The method of claim 19 wherein the reaction mixture further comprises a component containing a metal selected from the group consisting of zinc, manganese, and mixtures thereof, an antimony containing component, and a phosphorus containing component. 29. The method of claim 28 wherein the metal containing component is zinc acetate or manganese acetate, the antimony containing component is antimony trioxide, and the phosphorus containing component is phosphoric acid. 30. The method of claim 29 wherein the metal containing component is zinc acetate present in an amount from about 10 to about 200 ppm. 31. The method of claim 29 wherein the antimony trioxide is present in an amount from about 20 to about 500 ppm. 32. The method of claim 29 wherein the phosphoric acid is present in an amount from about 5 to about 200 ppm. 33. The method of claim 18 further comprising one or more components selected from the group consisting an iron containing compound, a toner, a cobalt containing compound, and mixtures thereof. 34. The method of claim 18, wherein 0.0 ppm titanium metal is added to the reaction mixture. titanium atoms present in an amount of 0.0 to 5 ppm. 39. The polyester composition of claim 35 wherein the diacid residue is selected from the group consisting of dicarboxylic acid residues, dicarboxylic acid derivative residues, and mixtures thereof. 40. The polyester composition of claim 39 wherein the diacid residue is a dicarboxylic acid ester residue. 41. The polyester composition of claim 35 wherein the diacid residue is a dimethyl terephthalate residue. 42. The polyester composition of claim 35 wherein the diol residue is a glycol residue. 43. 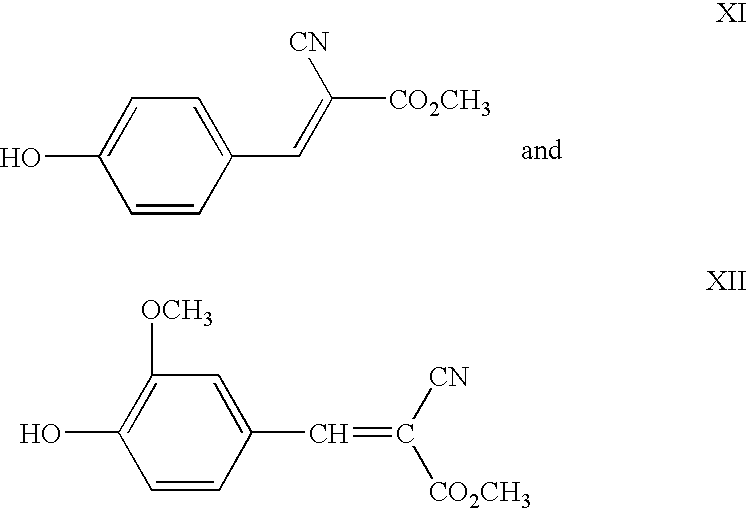 The polyester composition of claim 35 wherein the diol component is selected from the group consisting of residue of ethylene glycol; 1,4-cyclohexanedimethanol; 1,2-propanediol; 1,3-propanediol; 1,4-butanediol; 2,2-dimethyl-1,3-propanediol; 1,6-hexanediol; 1,2-cyclohexanediol; 1,4-cyclohexanediol; 1,2-cyclohexanedimethanol; 1,3-cyclohexanedimethanol; 2,2,4,4-tetramethyl-1,3-cyclobutane diol; X,8-bis(hydroxymethyl)tricyclo-[5.2.1.0]-decane, wherein X represents 3, 4, or 5; diols containing one or more oxygen atoms in a chain and mixtures thereof. 44. The polyester composition of claim 35 wherein the diacid residue comprises a component selected from the groups consisting of residues of terephthalic acid, naphthalene dicarboxylic acid, isophthalic acid, 1,4-cyclohexanedicarboxylic acid, 1,3-cyclohexanedicarboxylic acid, succinic acid, glutaric acid, adipic acid, sebacic acid, 1,12-dodecanedioic acid, and esters thereof, and mixtures thereof. 45. The polyester composition of claim 35 wherein the molar ratio of the diol residues to the diacid residues is from about 0.5 to about 4. 46. The polyester composition of claim 35 having less than about 20 meq/g of carboxyl ends. 47. The polyester composition of claim 35 wherein the antimony atoms are present in an amount from about 20 to about 500 ppm. 48. The polyester composition of claim 35 wherein the phosphorus atoms are present in an amount from about 10 to about 200 ppm. 49. The polyester composition of claim 35 wherein the amount of titanium metal is 0.0 ppm. 50. The polyester composition of claim 35 further comprising black iron oxide. 51. The polyester composition of claim 50 wherein the amount of black iron oxide ranges from 1 ppm to 10 ppm. 52. A thermoplastic article prepared from the polyester of claim 35. 53. The thermoplastic article of claim 52 wherein said article is selected from the group consisting of bottles, storage containers, sheets, films, plaques, hoses, tubes, and syringes. 54. The method of claim 2, 3, 20, or 21 wherein p is an integer less than 8. 55. The method of claim 54 wherein p is from 1-3. 56. The polyester composition of claim 36 or 37 wherein p is an integer less than 8. 57. The polyester composition of claim 56 wherein p is from 1-3. MXPA06000426A MXPA06000426A (en) 2003-07-11 2004-06-28 Addition of uv absorbers to pet process for maximum yield. ES2223958T3 (en) 2005-03-01 Procedures for injection postpolimeracion with extruder in the production of condensation polymers. 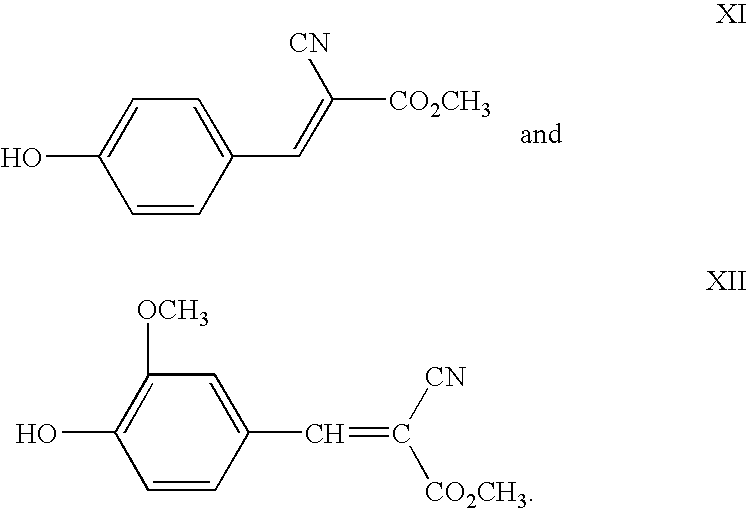 ES2225131T3 (en) 2005-03-16 Hydroxylic derivatives as additives in thermoplastic molding compositions. ES2256745T3 (en) 2006-07-16 Thermoplastic polyesters saturated / unsaturated biodegradable. ES2208905T3 (en) 2004-06-16 Method for deactivation of the catalyst in the continuous production of pli (ethylene terephthalate). 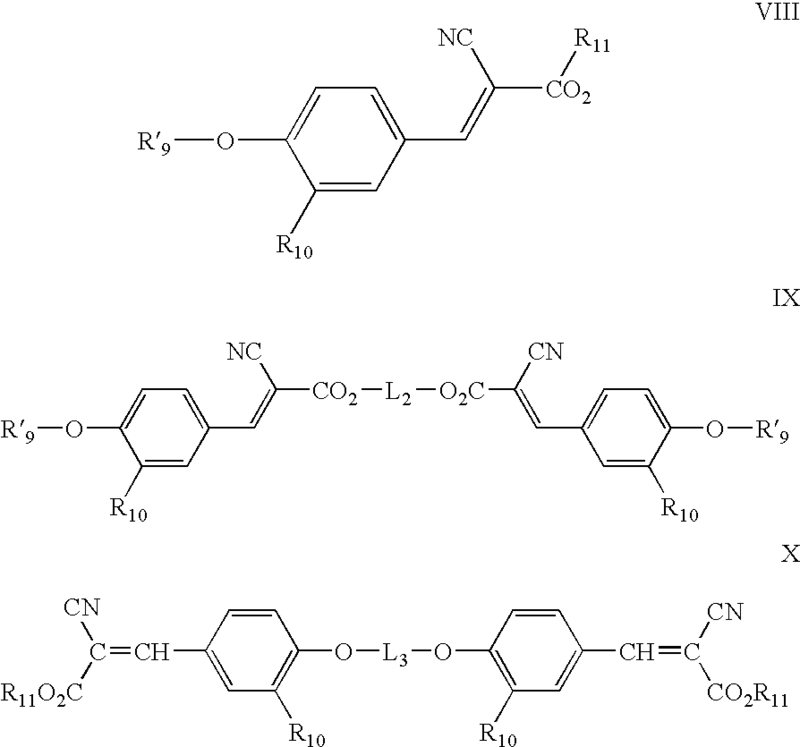 ES2294428T3 (en) 2008-04-01 Copolymers of biodegradable aliphatic polyesters.